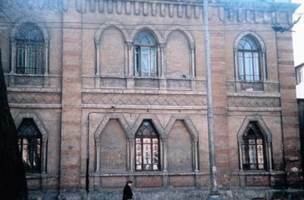 Irina Zborovskaya, Executive Director of Joint in Odesa, stated that the purpose of the Beit Grand Jewish cultural center is provision of a rich agenda of Jewish cultural activities for local middle-class Jews. The Jewish population, she noted, is much more comfortable with Jewish culture than with Jewish religious content. Parents, she continued, want their children to become familiar with their Jewish heritage through Jewish culture. For current adolescents, whose entire lives have occurred in the post-Soviet era, public identification as Jews comes naturally and they are eager to participate in Jewish cultural activities. Most youngsters who come to Beit Grand, said Ms. Zborovskaya, are enrolled in the ORT Jewish day school; in addition to participating in activities planned for their respective age group, many Beit Grand adolescents volunteer as ushers or helpers in another capacity for large events at the facility. 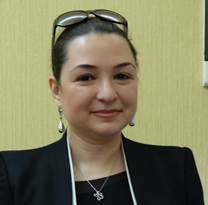 Elina Korneva, director of the Jewish cultural center at Beit Grand, outlined its activities. A nursery school enrolls 41 children in a format that emphasizes day care, rather than preschool education. The monthly tuition of $500 is designed to attract upper middle class families. Activities include kabbalat Shabbat (welcoming Shabbat) and age-appropriate observance of most Jewish holidays. Lacking outdoor play space, Beit Grand has developed a terrace playground several floors above street level. For older children, Beit Grand offers a number of afterschool arts classes, dance and drama groups, and vocal ensembles. Enrolled youngsters perform in the Beit Grand theater for families and friends. Adolescents have their own programs, which include visiting lonely elderly Jews in their apartments. Beit Grand organizes its own Jewish trivia teams that compete in local contests. The facility also hosts a computer lab. A series of week-long day camps is offered in the summer, each focusing on a specific activity (such as art, music, sports, computers, English) or on a general program. Elina Korneva, director of the Jewish Cultural Center at Beit Grand, manages a multi-faceted program. Adult activities, said Ms. Korneva, include lectures on various topics, amateur film production, and cultural programs. Beit Grand has rented commercial restaurant kitchens for cooking classes and is always looking for other off-site areas in which programs can be held that appeal to middle class adults and families. The Beit Grand building is attractive and inviting. Its Jewish cultural center offers a diverse and multi-faceted program. Yet Ms. Zborovskaya acknowledges that its financial foundation is shaky. High user-fees, she acknowledged deter many potential participants, and the building has failed to attract commercial tenants whose rental fees were expected to support cultural activities. The ORT school pupils who constitute its primary younger constituency do not comprise the target juvenile demographic group - upper middle class kids otherwise unengaged in Jewish life. Presumably, upper-income Jewish families seek leisure-time activities in secular private classes and clubs. On another level, the shallowness of specifically Jewish programming at Beit Grand has alienated individuals who seek a more intensively Jewish cultural and/or intellectual experience. The Migdal International Jewish Community Center (see below) is perceived as more authentically Jewish and more home-like, more welcoming, much less a foreign implant. 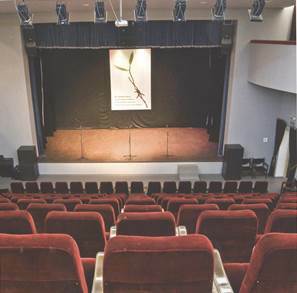 The Beit Grand theater is equipped with a modern sound system and has been used for conferences, lectures, and musical and drama productions.However, its small seating capacity (204 individuals) has limited its use for community functions. 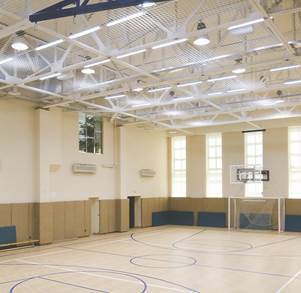 The gymnasium or sports hall is used by neighborhood schools for physical education classes, but Beit Grand itself does not organize ongoing sports activities. 8. The Migdal International Jewish Community Сenter (Международный Еврейский Общинный Центр «Мигдаль») operates almost 100 programs in the two-story former synagogue of the Union of Kosher Butchers. Constructed in 1909, the synagogue was closed by Soviet authorities in 1925 and subsequently used by the KGB. It was returned to the Jewish Cultural Society (Общество еврейской културы), a cover organization managed by Chabad Chief Rabbi Avrum Wolf. Rabbi Wolf “leases” the building to Migdal free of charge. Migdal is led by Kira Verkhovskaya, a local woman of many talents. 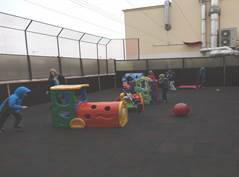 Among the most accomplished fundraisers for Jewish causes in Ukraine, Ms. Verkhovskaya has attracted donations that have transformed the century-old former synagogue from a decrepit, structurally unsound edifice into a safe, functional Jewish community center with multiple activity rooms. The central staircase has been secured and strengthened, corridors widened, heating system and lavatories modernized, and decor upgraded. The roof is next, said Ms. Verkhovskaya. The exterior may be scrubbed sometime in the future. The exterior of the Migdal Jewish community center reflects the age of the building, but its interior corridors have been modernized. The glass-front bookcase contains copies of some of the many Migdal publications on Odesa and general Jewish history and culture; the sale of these volumes generates needed revenue. 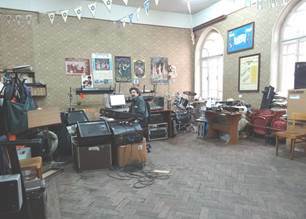 The music studio at left is one of several Migdal creative venues. Photo of Migdal (former synagogue) exterior at www.migdal.ru. Retrieved July 5, 2013. Both interior photos: the writer. The Migdal building contains a small Jewish community library. A communal hall hosts many community events, and art by local Jewish artists is displayed in special exhibits and in various places throughout the structure. A small computer facility is located on the second floor. Migdal operates afterschool activities in creative arts as well as classes in English and Hebrew; as many as 125 youngsters participate in these programs each day. 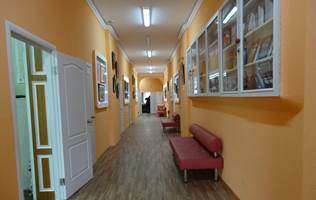 Additionally, it offers community classes in art, music, drama, dance, fitness, computer technology, and Jewish history and culture; most of its cultural activities, said Ms. Verkhovskaya, have a strong Jewish theme. A special set of programs convenes for retired Jews. See pages 32-33 for an interview with Ms. Zborovskaya. For further information on Beit Grand, see the section on the Migdal International Jewish Community Center (immediately below), an interview with Gennady Katzen, pages 19-20, and the Odesa hesed (Shaarei Tzion), pages 22-24.